Based on empiric data of breeding success and accurate number trends in The Netherlands, a population model for the black tern was constructed. This model is based on Leslie matrices. Reproductive parameters from the four most important landscape types (river landscape, agricultural grasslands, peat marsh and heath land/moors) are used as model input. Highly accurate national population trend data were used to obtain the best (least square) estimate of overall adult and subadult survival (resp. 0.849 and 0.595). Estimating survival parameters in this way might be useful for threatened (bird) species, especially if catching and ringing is difficult or less desired from a conservation perspective. The model shows the actual importance of the river landscape as the main source for reproductive output of the Dutch black tern population. 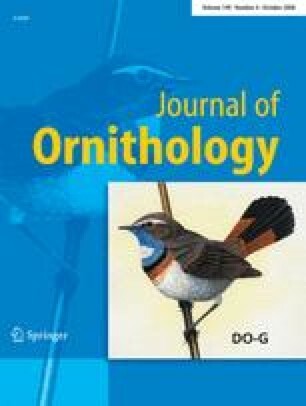 The prediction model was subsequently used to test different conservation strategies for the Dutch black tern population. Conservation strategies ranged from a null scenario (no change in conservation effort) to in- or decreasing the number of rafts in the most productive landscape (river landscape) to a scenario where breeding success is improved recently in agricultural grasslands via minimizing disturbance. For all scenarios, the model predicts a slow to rapid population increase in the Dutch black tern population after 10–20 years. Improving breeding success in agricultural grasslands habitat has the highest added value. Vogelbescherming Nederland gave financial support in the framework of the Dutch Marshland Protection Plan. S. Dirksen gave useful comments on the earlier versions of this paper. Suggestions of two anonymous referees were also used to improve the paper. P. Szczys kindly gave comments on the manuscript and revised the English. Many persons and institutes supplied information about breeding numbers or breeding success with special thanks to Sovon for Dutch census data and Natuurmonumenten and Staatsbosbeheer for permission to study black terns in their reserves.